Chewy steak and tender snapper get all wrapped up in these crowd-pleasing nibbles. In a large bowl, toss the cabbage with half of the lime juice. In a small bowl, whisk together the sour cream and remaining lime juice. Cover and refrigerate. Preheat the oven to 250 degrees . Spread the tortillas on a baking sheet, cover with foil and warm in the oven for 10 minutes. Meanwhile, in a large bowl, whisk the garlic powder, paprika, cumin, chili powder and 2 teaspoons salt. Add the steak, tossing to coat. In a large skillet, heat 1/4 cup oil over medium-high heat until rippling. Add the steak, lower the heat to medium and cook, turning occasionally, until browned, about 5 minutes. Transfer to a large plate. Add the remaining 2 tablespoons oil to the skillet. Season the fish lightly with salt and pepper. Cook, in the skillet, turning once, until golden, about 5 minutes. Lay the tortillas on a work surface. Spread 1 tablespoon guacamole on each, then top with some of the cabbage. Divide the meat among 8 tortillas and the fish among 8 tortillas. Fold to form tacos. 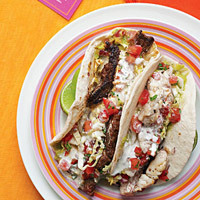 Serve with more guacamole and cabbage, the lime-sour cream and the salsa.